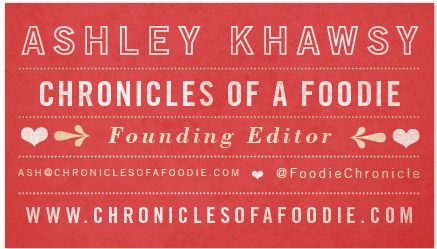 Chronicles of a Foodie: Meet Minted! Today I'm going to let you all in on a little secret...being a blogger isn't all just online communications...we actually do talk to people (GASP!). On occasion I tear myself away from my laptop. 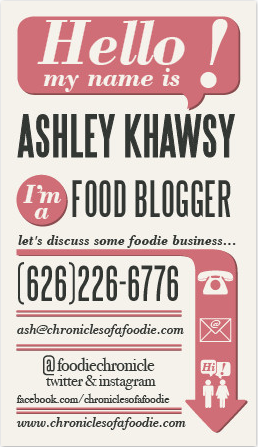 I've had the opportunity to meet some incredible people being a food blogger and keeping in touch with these awesome contacts is even easier when you have a sweet business card. Minted isn't just another site to get some personalized paper goods. It's THE site. Minted has over 200 beautiful business card templates that I have yet to see offered anywhere else, which is a huge deal to me since I'm all about being different. What I love most about this site is that these gorgeous business cards were created by indie designers from all over the world! As a blogger I appreciate businesses that go the extra mile to let us creative types get our names out there in the inter-web. "We believe that great design lives and thrives in the hands of indie designers that people may not have access to through traditional retailers. Our goal is to use technology to allow our community to discover the work of great designers from all over the world. And at the same time, create a place where designers can get exposure and build their careers." I've been in desperate need of some fresh new business cards so I perused around Minted to find the one...and instead I ended up finding the three. Second little secret of the day, I'm a pretty indecisive person. I know, what a terrible quality for a foodie to have! So, like I always do, I'm asking for someone else's opinion! I need help choosing which one of these cards best embodies my delicious site! So what do you think? 1, 2 or 3? Or none? Let me know in the comments! I had a ton of fun personalizing different card styles and really loved all the colors offered for each design! If you can't find a business card here, you won't be able to find one anywhere! So go ahead! 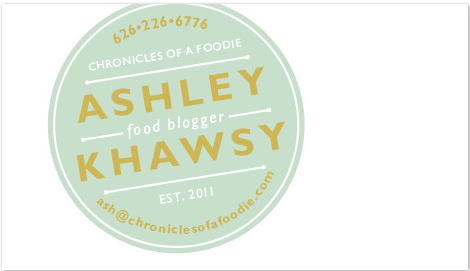 Create your own Minted Business Cards!